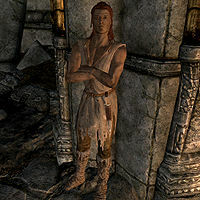 Garvey, a Breton scout, is one of the poor and sick of Markarth. He resides in The Warrens, and is an expert level trainer in Sneak. He spends most of the day standing with his back up against the wall near the entrance to the Warrens. When passing by he will be quick to tell you that "The Warrens isn't a place for your type. What do you want?" He will give you the most information on what the Warrens are by telling you that "It's where you go if you can't afford a room anywhere else. About the time they opened the mines, someone got the idea to throw beds in here." You can also ask him about the fact that only the poor and sick happen to live in the Warrens which will cause him to reveal the injustice of Markarth by saying "That's right. Welcome to Markarth, traveler. Thank the Divines you can choose to live somewhere else. Laborers. The sick. The lame. We're all here." During your investigation into the Forsworn he can be asked about whether or not he knew Weylin, to which he will respond "Oh yes. I know everyone who sleeps in the Warrens. Kind of the one who passes the keys around. I guess someone else will be taking his room, now." He wears a set of ragged robes and ragged boots. He is equipped with an iron dagger, and carries a key to his room and a key to Weylin's room. This page was last modified on 3 December 2017, at 12:59.